The so-called Italian Diaspora, indicating a large-scale migration of Italians away from their country during the nineteenth and twentieth centuries, occurred in three different waves. The first wave occurred between the unification of Italy in 1861 and 1900, the second wave occurred between 1900-40 during the beginning of World War I, and the third wave occurred following World War II along with Europeans from various countries. Poverty was the main reason for leaving, specifically the lack of land as property became subdivided over generations; especially in the South of Italy where conditions were harsh. Secondary reasons for the diaspora include internal political and economic problems, as well as organized crime from economic difficulties in the former Kingdom of the two Sicilies. Until the 1860s, Italy was a partially rural society with many small towns and cities and almost no modern industry, in which land management practices, especially in the South and North-East, did not easily convince farmers to stay on the land and work the soil. Another factor was related to the overpopulation of southern Italy after the improvements of the socio-economic conditions, following the unification process. Indeed, southern Italian families after 1861 started to have access (for the first time) to hospitals, improved hygienic conditions and normal food supply. This created a demographic boom and forced the new generations to emigrate en masse at the end of the nineteenth century and beginning of the twentieth century, mostly to the Americas. Concurrently, industrial capital spread from its earlier concentration in the cities of northern Europe and Great Britain to those of the Americas, and to plantations and mines in newer colonies in Africa and Asia. This new migration of capital created millions of unskilled jobs around the world and was responsible for the simultaneous mass migration of Italians on the search for "work and bread." Like preceding migrations from Italy, the proletarian mass migrations of the late-nineteenth century created multiple diasporas that gave new meanings to the adjective "Italian." Between 1861-1985, 29,036,000 Italians emigrated to other countries; of whom 16,000,000 (55%) arrived before the outbreak of the First World War. About 10,275,000 returned to Italy (35%), while 18,761,000 permanently settled overseas (65%). In 2011 in the world there were 4,115,235 Italian citizens living outside Italy and several tens of millions of descendants of Italians, who emigrated in the last two centuries. The Unification of Italy broke down the feudal land system, which had survived in the south since the Middle Ages, especially where land had been the inalienable property of aristocrats, religious bodies or the king. The breakdown of feudalism, however, and redistribution of land did not necessarily lead to small farmers in the south winding up with land of their own or land they could work and make profit from. Many remained landless, and plots grew smaller and smaller and so less and less productive as land was subdivided amongst heirs. Between 1860 and World War I, 9,000,000 Italians left permanently of a total of 16 million who emigrated, most from the south and most travelling to North or South America. The numbers may have even been higher, 14,000,000 from 1876-1914, according to another study. Annual emigration averaged almost 220,000 in the period 1876-1900, and almost 650,000 from 1901 through 1915. Prior to 1900 the majority of Italian immigrants were from northern and central Italy. Two-thirds of the migrants who left Italy between 1870-1914 were men with traditional skills. Peasants were half of all migrants before 1896. As the number of Italian emigrants abroad increased, so did their remittances, which encouraged further emigration, even in the face of factors that might logically be thought to decrease the need to leave, such as increased salaries at home. It has been termed "persistent and path-dependent emigration flow". Friends and relatives who left first sent back money for tickets and helped relatives as they arrived. That tended to support an emigration flow since even improving conditions in the original country took a while to trickle down to potential emigrants to convince them not to leave. The emigrant flow was stemmed only by dramatic events, such as the outbreak of World War I, which greatly disrupted the flow of people trying to leave Europe, and the restrictions on immigration that were put in place by receiving countries. Examples of such restrictions in the United States were the Emergency Quota Act of 1921 and the Immigration Act of 1924. Restrictive legislation to limit emigration from Italy was introduced by the fascist government of the 1920s and 1930s. The Italian diaspora did not affect all regions of the nation equally. In the second phase of emigration (1900 to World War I), slightly less than half of emigrants were from the south and most of them were from rural areas, as they were driven off the land by inefficient land management, lawlessness and sickness (pellagra and cholera). Robert Foerster, in Italian Emigration of our Times (1919) says, "[Emigration has been]… well nigh expulsion; it has been exodus, in the sense of depopulation; it has been characteristically permanent". Mezzadria, a form of sharefarming where tenant families obtained a plot to work on from an owner and kept a reasonable share of the profits, was more prevalent in central Italy, which is one of the reasons that there was less emigration from that part of Italy. The south lacked entrepreneurs, and absentee landlords were common. Although owning land was the basic yardstick of wealth, farming there was socially despised. People invested not in agricultural equipment; but in such things as low-risk state bonds. The rule that emigration from cities was negligible has an important exception, in Naples. The city went from being the capital of its own kingdom in 1860 to being just another large city in Italy. The loss of bureaucratical jobs and the subsequently declining financial situation led to high unemployment in the area. In the early-1880s, epidemics of cholera also struck the city, causing many people to leave. The epidemics were the driving force behind the decision to rebuild entire sections of the city, an undertaking known as the "risanamento" (literally "making healthy again"), a pursuit that lasted until the start of World War I. During the first few years before the unification of Italy, emigration was not particularly controlled by the state. Emigrants were often in the hands of emigration agents whose job was to make money for themselves by moving emigrants. Such labor agents and recruiters were called padroni, translating to patron or boss. Abuses led to the first migration law in Italy, passed in 1888, to bring the many emigration agencies under state control. On 31 January 1901, the Commissariat of Emigration was created, granting licenses to carriers, enforcing fixed ticket costs, keeping order at ports of embarkation, providing health inspection for those leaving, setting up hostels and care facilities and arranging agreements with receiving countries to help care for those arriving. The Commissariat tried to take care of emigrants before they left and after they arrived, such as dealing with the American laws that discriminated against alien workers (like the Alien Contract Labor Law) and even suspending, for a while, emigration to Brazil, where many migrants had wound up as virtual slaves on large coffee plantations. The Commissariat also helped to set up remittances sent by emigrants from the United States back to their motherland, which turned into a constant flow of money amounting, by some accounts, to about 5% of the Italian GNP. In 1903, the Commissariat also set the available ports of embarkation as Palermo, Naples and Genoa, excluding the port of Venice, which had previously also been used. "…The stranger walking through a city like Naples can easily realize the problem the government has to do with. The side streets…are literally swarming with children, who sprawl in the paved roadway and on the sidewalks. They look dirty and happy…Suburbs of Naples… swarm with children who, for number, can only be compared to those in Delhi, Agra and other cities in the East Indies…." The extreme economic difficulties of post-war Italy and the severe internal tensions within the country, which led to the rise of fascism, led 614,000 immigrants away in 1920, half of them going to the United States. When the fascists came to power in 1922, there was a general slowdown in the flow of emigrants from Italy, eventually. However, during the first five years of fascist rule, 1,500,000 people left Italy. By then, the nature of the emigrants had changed; there was, for example, a marked increase in the rise of relatives outside the working age moving to be with their families, who had already left Italy. Arrival of the first Italian locomotive in Tripoli, Italian Libya, in 1912. Libya had some 150,000 Italians settlers when Italy entered World War II in 1940, constituting about 18% of the total population in Italian Libya. The Italians in Libya resided (and many still do) in most major cities like Tripoli (37% of the city was Italian), Benghazi (31%), and Hun (3%). Their numbers decreased after 1946. France and the UK took over the spoils of war that included Italian discovery and technical expertise in the extraction and production of crude oil, superhighways, irrigation, electricity. Most of Libya's Italian residents were expelled from the country in 1970, a year after Muammar Gaddafi seized power in a coup d'état. (a "day of vengeance" on 7 October 1970), but a few hundred Italian settlers returned to Libya in the 2000s (decade). Somalia had some 50,000 Italian Somali settlers during World War II, constituting about 5% of the total population in Italian Somaliland. The Italians resided in most major cities in the central and southern parts of the territory, with around 10,000 living in the capital Mogadishu. Other major areas of settlement included Jowhar, which was founded by the Italian prince Luigi Amedeo, Duke of the Abruzzi. Italian used to be a major language, but its influence significantly diminished following independence. It is now most frequently heard among older generations. Although Italians did not emigrate to South Africa in large numbers, those who arrived there have nevertheless made an impact on the country. Before World War II, relatively few Italian immigrants arrived, though there were some prominent exceptions such as the Cape's first Prime Minister John Molteno. South African Italians made big headlines during World War II, when Italians captured in Italian East Africa needed to be sent to a safe stronghold to be detained as prisoners of war (POWs). South Africa was the perfect destination, and the first POWs arrived in Durban, in 1941. 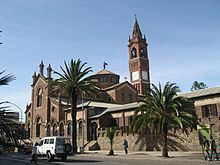 Church of Our Lady of the Rosary in Asmara, built by Italian Eritreans in 1923. The Italians had a significantly large, but very quickly diminished population in Africa. In 1926, there were 90,000 Italians in Tunisia, compared to 70,000 Frenchmen (unusual since Tunisia was a French protectorate). Former Italian communities also once thrived in the Horn of Africa, with about 50,000 Italian settlers living in Eritrea in 1935. The Italian Eritrean population grew from 4,000 during World War I to nearly 100,000 at the beginning of World War II. The size of the Italian Egyptian community had also reached around 55,000 just before World War II, forming the second-largest expatriate community in Egypt. During the Italian occupation of Ethiopia, roughly 300,000 Italians settled in the Italian East Africa (1936-1947). Over 49,000 lived in Asmara in 1939 (around 10% of the city's population), and over 38,000 resided in Addis Ababa. After independence, many Italians remained for decades after receiving full pardon by Emperor Selassie, as he saw the opportunity to continue the modernization efforts of the country. However, due to the Ethiopian Civil War in 1974, nearly 22,000 Italo-Ethiopians left the country. 80 original Italian colonists remain alive in 2007, and nearly 2000 mixed descendants of Italians and Ethiopians. In the 2000s, some Italian companies returned to operate in Ethiopia, and a large number of Italian technicians and managers arrived with their families, residing mainly in the metropolitan area of the capital. A few Italian settlers stayed in Portuguese colonies in Africa after World War II. As the Portuguese government had sought to enlarge the small Portuguese population through emigration from Europe, the Italian migrants gradually assimilated into the Angolan Portuguese community. Italian immigrants arriving in São Paulo, Brazil, circa 1890. The South American country has the largest Italian population outside Italy. Italian immigration to Argentina, along with Spanish, formed the backbone of Argentine society. Minor groups of Italians started to emigrate to Argentina as early as the second half of the seventeenth century. However, the stream of Italian immigration to Argentina became a mass phenomenon between 1880-1920 when Italy was facing social and economic disturbances. Platinean culture has significant connections to Italian culture in terms of language, customs and traditions. It is estimated up to 62.5% of the population or 25 million Argentines have full or partial Italian ancestry. According to the Ministry of the Interior of Italy, there are 527,570 Italian citizens living in the Argentine Republic, including Argentines with dual citizenship. Italian Brazilians are the largest number of people with full or partial Italian ancestry outside Italy, with São Paulo being the most populous city with Italian ancestry in the world. Nowadays, it is possible to find millions of descendants of Italians, from the southeastern state of Minas Gerais to the southernmost state of Rio Grande do Sul, with the majority living in São Paulo state and the highest percentage in the southeastern state of Espírito Santo (60-75%). Small southern Brazilian towns, such as Nova Veneza, have as much as 95% of their population of Italian descent. A substantial influx of Italian immigrants to Canada began in the early-twentieth century when over 60,000 Italians moved to Canada between 1900-13. Approximately 40,000 Italians came to Canada during the interwar period of 1914-18, predominantly from southern Italy where an economic depression and overpopulation had left many families in poverty. Between the early-1950s and the mid-1960s, approximately 20,000 to 30,000 Italians emigrated to Canada each year. Pier 21 in Halifax, Nova Scotia was an influential port of Italian immigration between 1928 until it ceased operations in 1971, where 471,940 individuals came to Canada from Italy making them the third-largest ethnic group to emigrate to Canada during that time period. Almost 1,000,000 Italians reside in the Province of Ontario, making it a strong global representation of the Italian diaspora. For example, Hamilton, Ontario, has around 24,000 residents with ties to its sister city Racalmuto in Sicily. The city of Vaughan, just outside Toronto, and the town of King, just north of Vaughan, have the two largest concentrations of Italians in Canada at over 30% of the total population of each community. 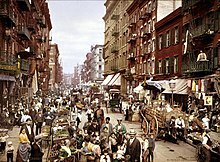 From the late-nineteenth century until the 1930s, the United States was a main destination for Italian immigrants, with most first settling in the New York metropolitan area, but with other major Italian American communities developing in Boston, Philadelphia, Chicago, Cleveland, Detroit, St. Louis, Pittsburgh, Baltimore, San Francisco, and New Orleans. Most Italian immigrants to the United States came from the Southern regions of Italy, namely Campania, Apulia, Basilicata, Calabria, and Sicily. Many of them coming to America were also small landowners. Italian Americans are known for their tight-knit communities and ethnic pride, and have been highly influential in the development of modern U.S. culture, particularly in the Northeastern region of the country. Italian American communities have often been depicted in U.S. film and television, with distinct Italian-influenced dialects of English prominently spoken by many characters. Although many do not speak Italian fluently, over a million still speak Italian at home, according to the 2000 US Census. Today, New York City still remains home to the largest Italian population in North America, with the borough of Staten Island home to at least 400,000 people who claim full or partial Italian ancestry. Another very important Italian community is in Venezuela, which developed especially after the Second World War. They number about 2,000,000 including people with at the least one Italian grandparent. The Italo-Venezuelans have obtained significant results in the contemporary society of Venezuela. The Italian Embassy calculates that one-quarter of the Venezuelan industries, not related to the oil sector, are directly or indirectly owned and/or managed by Italian-Venezuelans. Italian migration into what is today France has been going on, in different migrating cycles from the end of the nineteenth century to the present day. In addition, Corsica passed from the Republic of Genoa to France in 1770, and the area around Nice and Savoy from the Kingdom of Sardinia to France in 1860. Initially, Italian immigration to modern France (late-eighteenth to the early-twentieth centuries) came predominantly from northern Italy (Piedmont, Veneto), then from central Italy (Marche, Umbria), mostly to the bordering southeastern region of Provence. It wasn't until after World War II that large numbers of immigrants from southern Italy emigrated to France, usually settling in industrialised areas of France; such as Lorraine, Paris and Lyon. Today, it is estimated that as many as 5,000,000 French nationals have Italian ancestry going back three generations. In Switzerland, Italian immigrants (not to be confused with a large autochthonous population of Italophones in Ticino and Grigioni) reached the country starting in the late-nineteenth century, most of whom eventually returned to Italy after the rise of Italian Fascism. Future Fascist leader Benito Mussolini emigrated to Switzerland in 1902, only to be deported after becoming involved in the socialist movement. A new migratory wave began after 1945, favoured by the lax immigration laws then in force. The English towns of Bedford and Hoddesdon have sizeable Italian populations. A significant number of Italians came to Bedford in the 1950s due to the London Brick Company finding itself short of workers in the wake of the post-war reconstruction boom. As a result, today Bedford has the largest concentration of Italian families in the UK, and the third-highest number of Italian immigrants overall with around one-fifth of its overall population being of Italian descent. In Hoddesdon, many Italians, mostly descending from Sicily, migrated there and across the Lea Valley in the 1950s due to opportunities working in local garden nurseries. They were drawn to the area by the rich agricultural landscape and better pay in comparison to back home. Today, the town's Italian community has had such a significant impact that an Italian consul, Carmelo Nicastro, was even elected for the area. Italians first arrived in Australia in the decades immediately following the Unification, but the most significant wave was after World War II ended in 1945, particularly from 1950-65. It was those Italian migrants and their descendants who have had a significant impact on the culture, society and economy of Australia. The 2006 Australian Census counted 199,124 persons who were born in Italy, and Italian is the fifth-most identified ancestry in Australia with 852,418 responses. Italian Australians experienced a low rate of return migration to Italy, relative to the Italian diaspora in other countries. Unlike Australia, New Zealand has never received much immigration from Italy. Several hundreds of them, mostly fishermen, made it in the late-1890s. As of 2011, roughly 3,500 New Zealanders claim Italian heritage. After 1890, Italian contribution to the emigration flow to the New World was significant. By 1870, Italy had about 25,000,000 inhabitants (compared to 40,000,000 in Germany and 30,000,000 in the United Kingdom). The high point of Italian emigration was in 1913, when 872,598 persons left Italy. By extrapolating from the 25,000,000 inhabitants of Italy at the time of unification, natural birth and death rates, without emigration, there would have been a population of about 65,000,000 by 1970. Instead, because of emigration earlier in the century, there were only 54,000,000. The Italian constitutional referendum, 2016 provided data on the number of registered Italian citizens living outside Italy by country. The highest number is in Argentina, with 673,238 registered Italians residing in the country in 2016, followed by Germany with 581,433, Switzerland 482,539, France 329,202, Brazil 325,555, the UK 232,932, Belgium 225,801, the USA 218,407, Australia 120,791 and Spain 118,879. ^ a b Pozzetta, George E., Bruno Ramirez, and Robert F. Harney. The Italian Diaspora: Migration across the Globe. Toronto: Multicultural History Society of Ontario, 1992. ^ a b c d McDonald, J.S. (October 1958). "Some Socio-Economic Emigration Differentials in Rural Italy, 1902-1913". Economic Development and Cultural Change. 7 (1): 55–72. doi:10.1086/449779. ISSN 0013-0079. ^ a b c d e Gabaccia, Donna (200). Italy's Many Diasporas. New York: Routledge. pp. 58–80. ^ Pozzetta, George E. (1980). Pane e Lavoro: The Italian American Working Class. Toronto: Multicultural History Society of Ontorio. ^ "Italian Immigration - The Great Italian Diaspora". Italianlegacy.com. Retrieved 11 January 2018. ^ "Fondazione Migrantes:"Rapporto Italiani nel Mondo 2011" p.8 (in Italian)" (PDF). Chiesacattolica.it. Retrieved 11 January 2018. ^ "Statistics of Italian emigration from the Catholic Church (in Italian)" (PDF). Chiesacattolica.it. Retrieved 11 January 2018. ^ "Emigrazione Italiana: il più grande esodo della Storia Moderna - emigrati.it". Emigrati.it. Retrieved 11 January 2018. ^ a b Hatton, Timothy J. and Jeffrey G. Williamson; Williamson, Jeffrey G (September 1994). "What Drove the Mass Migrations from Europe in the Late Nineteenth Century?". Population and Development Review. Population Council. 20 (3): 533–559. doi:10.2307/2137600. ISSN 0098-7921. JSTOR 2137600. ^ a b c Monticelli, Giuseppe Lucrezio (Summer 1967). "Italian Emigration: Basic Characteristic and Trends with Special Reference to the Last Twenty Years". International Migration Review. The Center for Migration Studies of New York, Inc. 1 (3, Special issue, The Italian Experience in Emigration): 10–24. doi:10.2307/3002737. ISSN 0197-9183. JSTOR 3002737. ^ a b c Cometti, Elizabeth (December 1958). "Trends in Italian Emigration". The Western Political Quarterly. University of Utah. 11 (4): 820–834. doi:10.2307/443655. ISSN 0043-4078. JSTOR 443655. ^ Glazier, Ira (February 1993). "Review of: The National Integration of Italian Return Migration: 1870-1929, by Dino Cinel, New York Cambridge U. Press, 1991". The American Historical Review. 98 (1): 198–199. doi:10.2307/2166476. ISSN 0002-8762. JSTOR 2166476. ^ "Italian Emigration Law", New York Times, September 3, 1903. ^ Cannistraro, Philip V. and Gianfusto Rosoli; Rosoli, G (Winter 1979). "Fascist Emigration Policy in the 1930s: an Interpretative Framework". International Migration Review. The Center for Migration Studies of New York, Inc. 13 (4): 673–692. doi:10.2307/2545181. ISSN 0197-9183. JSTOR 2545181. PMID 12337317. ^ "Libya - History, People, & Government". Britannica.com. Retrieved 11 January 2018. ^ "Libya cuts ties to mark Italy era". News.bbc.co.uk. 27 October 2005. Retrieved 11 January 2018. ^ "SOMALIA: population growth of the whole country". Populstat.info. Retrieved 11 January 2018. ^ "Memories from Somalia-Part one". Hiiraan.com. Retrieved 11 January 2018. ^ "ITALIAN P.O.W. IN SOUTH AFRICA (Medical Services)". Samilitaryhistory.org. Retrieved 11 January 2018. ^ "Essay on Italian emigration to Eritrea (in Italian)" (PDF). Ilcornodafrica.it. Retrieved 11 January 2018. ^ "Brazil - the Country and its People" (PDF). www.brazil.org.uk. Archived from the original (PDF) on October 21, 2014. Retrieved December 20, 2014. ^ "Ministero dell'Interno". Infoaire.interno.it. Retrieved 11 January 2018. ^ "Italians - History of the Community". Milpovos.prefeitura.sp.gov.br. Archived from the original on 12 January 2009. Retrieved 11 January 2018. ^ Cilmar Franceschetto. Espírito Santo, lo stato più veneto del Brasile (in Italian), Retrieved 31 May 2016. ^ a b c "History - Pier 21". www.pier21.ca. ^ Samantha Craggs (June 24, 2012). "Soccer can't stop religious Racalmuto celebration". CBC. ^ "Immigration and Ethnocultural Diversity Highlight Tables Vaughan". Statistics Canada. ^ "Immigration and Ethnocultural Diversity Highlight Tables King". Statistics Canada. ^ Bureau, U.S. Census. "American FactFinder - Results". Factfinder.census.gov. Retrieved 11 January 2018. ^ a b c d Cohen, Robin (1995). Cambridge Survey. Books.google.com. ISBN 9780521444057. Retrieved 2009-05-11. ^ David Levinson (1998). Ethnic groups worldwide. Greenwood Publishing Group. pp. 88–90. ISBN 9781573560191. Retrieved 2009-06-27. ^ "La lunga storia dell'immigrazione in Svizzera". Swissinfo.ch. Retrieved 11 January 2018. ^ "Italians in Bedford". Theguardian.com. 23 January 2006. Retrieved 11 January 2018. ^ "Lee Valley little Sicily". Hertfordshirelife.co.uk. Retrieved 11 January 2018. ^ "Population of Italy". Tacitus.nu. Retrieved 11 January 2018. ^ Hatton. Cited from I. Ferenczi and W.F. Wilcox (1929). International Migrations, vol. 1, Statistics. New York: National Bureau of Economic Research. ^ * Sori, Ercole (1999). Guida all'Italia Contemporanea, vol 4. Comportamenti Sociali e Cultura: "Demografia e Movimenti di Popolazione". Milan: Garzanti. pp. 32–38. ISBN. ^ "Riepilogo estero - Risultati Referendum Costituzionale – 4 dicembre 2016". Repubblica.it. Retrieved 11 January 2018. Favero, Luigi; Tassello, Graziano (1978). Cent'anni di emigrazione italiana (1876-1976). Rome: Cser. Sori, Ercole (1979). L'emigrazione italiana dall'Unità alla seconda guerra mondiale. Bologna: Il Mulino. Moretti, Enrico (Autumn 1999). "Social Networks and Migrations: 1876-1913". International Migration Review. The Center for Migration Studies of New York, Inc. 33 (3): 640–657. ISSN 0197-9183. JSTOR 2547529. Tomasi, Silvano M. (Autumn 1965). "Review of: La Democrazia Italiana e l'emigrazione in America, by Grazie Dore, Brescia, Morcelliania, 1964". International Migration Digest. 2 (2): 221–223. doi:10.2307/3002874. ISSN 0538-8716. JSTOR 3002874. Wikimedia Commons has media related to Italian diaspora.